Before Tony called us to renovate his bathroom he was on the fence weather to gut the entire thing or just give it a face lift. As we all know it is always better to remove everything and start fresh. Well, Tony finally came around to his senses and said ok let’s do it. The demolition began and so did the issues. Tony had rotted framing studs, stop valves that did not hold, and under-framed floor joists. Many phone calls later Tony finally let me know he had it with the bad news and gave me full authority to just go ahead and do all necessary repairs without the need to consult with him for everything. The framing studs were replaced and sister studs were installed where necessary, same for the floor joists and of course all major plumbing was handled by the master plumber himself. A beautiful cast iron deep soaking bathtub was installed by his plumbing company. We insulated and installed drywall. Many design consultations later we finally had the perfect layout for the tiles and we installed all the tiles accordingly. The bathroom came out beautiful. We installed a great new high-hat/exhaust fan combination, re-wired the bathroom to the circuit panel with a dedicated line. 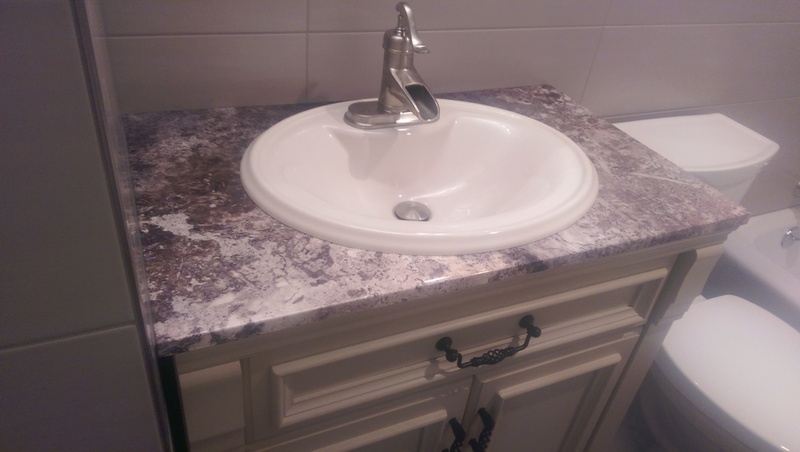 The bathroom was extended to fit a nice big vanity and brand new toilet was installed. Working with this master plumber and his sweet wife who had the eye of the designer was an absolute pleasure. We will contact you shortly to confirm your appointment. Thank you!